MICHIGAN (Bloomberg) – Ford Motor Co. said fourth-quarter profit fell 79 percent as its European operations reported a loss. Net income fell to $190 million, or 5 cents a share, from $886 million, or 25 cents, a year earlier, Ford said Friday in a statement. Profit excluding some items was 30 cents a share, trailing the 48-cent average estimate of 14 analysts surveyed by Bloomberg. Ford's European operations reported a $51 million loss, missing the company's expectations because of lower market share and higher costs. Ford reported a $253 million profit from the region a year earlier. The automaker's European sales in December dropped 23 percent as other manufacturers offered rebates to lure buyers. The European market “was incredibly competitive in the fourth quarter,” CFO Lewis Booth told reporters in Dearborn on Friday. The company also took a $960 million charge in the quarter because of a plan to pay investors in its convertible debt to swap their notes for shares. Sales were $32.5 billion, topping the $28.5 billion average estimate of 10 analysts. For all of 2010, Ford earned $6.56 billion, CEO Alan Mulally's second straight profitable year. Mulally, 65, improved the automaker's quality ratings and expanded the lineup with models like the Fiesta subcompact. Ford said profit-sharing checks for its 40,600 U.S. hourly workers will average $5,000, the highest since 2000. Buyers of Ford cars and trucks in the U.S. paid an average of $30,313 for the company's models last year, up 19 percent from 2002 and the first time Ford vehicles topped $30,000, according to auto researcher Edmunds.com. Ford's U.S. market share rose for the last two years, the first consecutive gains since 1992 to 1993. New models such as the Fiesta and redesigned Edge SUV helped propel Ford's U.S. deliveries up by 17 percent last year, more than the 11 percent industrywide gain. Ford this year is introducing new, more fuel-efficient versions of its Explorer SUV and Focus compact car. Ford boosted North American production by 3 percent during the period to 590,000 cars and trucks. Automotive debt, which excludes Ford Motor Credit, was $19.1 billion at the year's end, a decrease from $26.4 billion on Sept. 30, the company said. 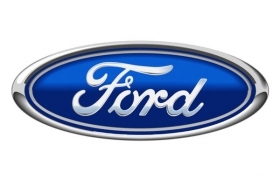 Ford reported that it had $20.5 billion in automotive cash at the end of the quarter, exceeding its automotive debt. Ford has more debt than rivals because it borrowed $23 billion in late 2006, after Mulally arrived from Boeing Co. and before credit markets froze. That enabled the automaker to avoid the bailouts and debt-forgiving bankruptcies that befell the predecessors of General Motors Co. and Chrysler Group in 2009. “From a PR standpoint, it doesn't get any better than last year for Ford,” Adam Jonas, an analyst with Morgan Stanley in New York, said in an interview. He described Ford as “overweight,” and predicts shares may reach $23 within 12 months. “Ford was the No. 1 beneficiary of Toyota's problems and the Government Motors moniker that was applied to GM,” he said. Mulally has said Ford's earnings will continue to improve this year as auto sales rise 3 to 4 percent globally. In the U.S., Ford projects light vehicle sales will range between 12.3 million and 13.3 million, up from last year's 11.6 million.